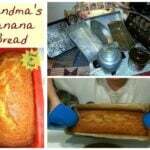 Grandma's Banana Bread. Easy recipe and gives you great results every time! Grandma’s Banana Bread. Easy recipe with no fuss or frills and gives you great results every time! 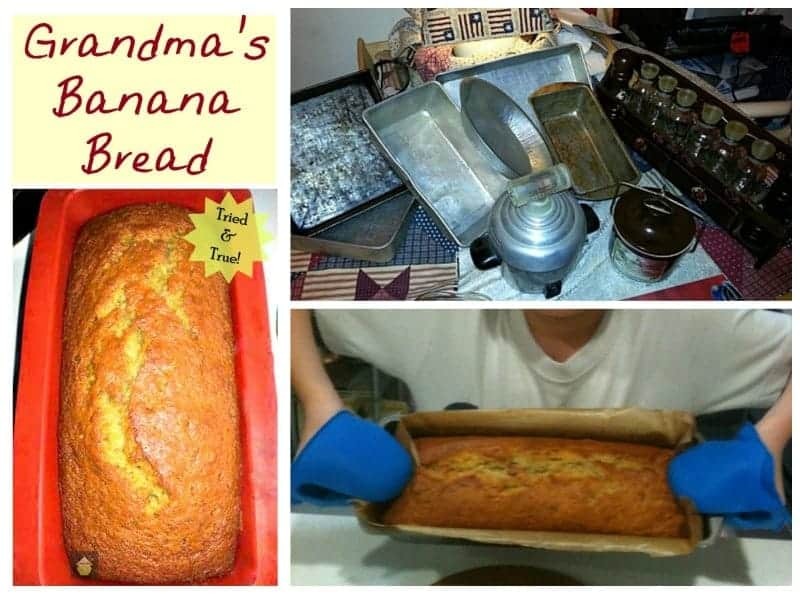 Grandma’s Banana Bread. Gosh this is a delicious recipe! This delicious recipe has been generously shared by one of our foodie friends, Heather. It can often be hard searching for a tried and tested recipe for a good cake, that will be moist, tasty and also look great, but Heather was lucky to have a grandma who enjoyed baking and keeping a record of all her recipes. This Banana Bread recipe dates back to at least the 1960’s, if not further back. 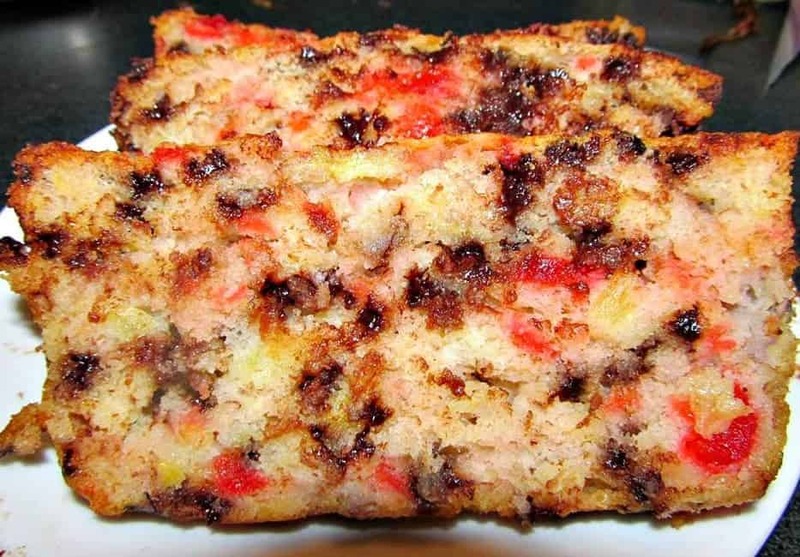 Grandma’s Banana Bread is a great way to use up over ripe bananas. The riper the better! The recipe is very straightforward and we’ve had some lovely stories and feedback from you saying you’ve baked Grandma’s Banana Bread with your son/daughter and they’ve enjoyed mixing the ingredients and of course, enjoyed eating their creation too. This particular recipe is quite sweet so if you haven’t got a sweet tooth, feel free to reduce the sugar by knocking about 1/3 off the amount listed in the ingredients. I’ll let Heather tell the story behind it! I sadly don’t have the paper it was written on anymore, it has crumbled over the years and was very hard to get the recipe off of, that’s why I copied it so I could have it forever! 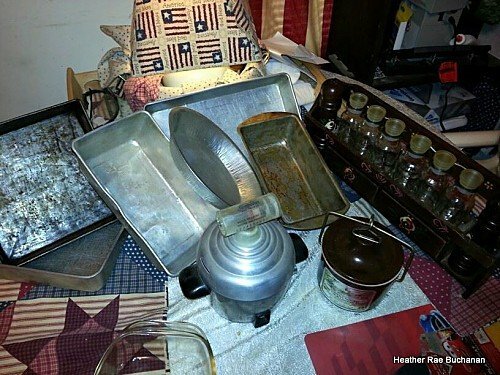 These are my grands old pans, egg cooker, and spice rack! If you’d like to get a new loaf pan, we can recommend this one, it’s non-stick, dishwasher safe and reasonably priced too. 7. Bake for 1 hour. Let cool on a wire rack. 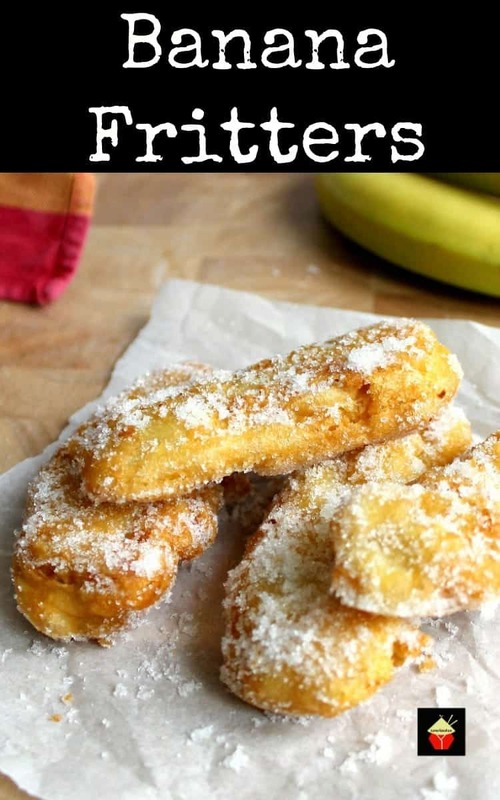 Here are a few more delicious banana recipes for you to enjoy! Was wondering if I could use thawed frozen bananas in Grandmas recipe? If so, do I use the same amount? Can’t wait to make this and your banana cookies! Hi Dunia, yes of course! Just make sure when they have thawed you use some kitchen paper to get any excess water off them otherwise your batter could end up a bit too wet! Made two loaves today and they are so darn good. Cant wait to make some more! The banana bread recipe here, is excellent. I made this tonight and it can out so good. Will definitely make again. Made this today. Put only half the sugar it was delicious! I made this recipe today! Yum! Delicious indeed. I only made small changes because it is perfect. I used Gold Medal bread flour, Turbinado Sugar in the Raw and added a1/2 cup of chopped pecans. Mix the Turbinado with the bananas. Because it has melted butter, use room temp bananas or the butter will gel. Eat right out of the oven or after it’s been cooled off and in fridge, it’s easier to cut. Toasted with a bit of butter is how we like it. And by far the easiest recipe and the tastiest. May i know the weight (grammes ) of 3 to 4 bananas used in this recipe.? Made this so many times now. It’s such a perfect recipe. Have tried so many recipes before and not one of them turned out so good. Thank you for sharing the recipe. Hi Julie, thanks for writing in. I’ve never tried this recipe using bisquik mix, so I can’t say how it would turn out with all the other ingredients. This recipe as it is has been made by lots of people and we even held a baking day on our Facebook page where lots of people joined in and baked this bread in real time and sent in their photos! So it certainly is a popular one. I would suggest you follow the recipe as it is, I’m pretty sure you won’t be disappointed. The use of sour cream in some recipes is to make the cake more moist and give it a smooth grain, however, this recipe wont need that at all. the bananas are more than enough to keep this from being dry and it’s a smooth grain in texture. Hope that helps and happy baking! This is the first time I’ve ever commented but I have been using this recipe over a year now and it turns out perfectly every time!!! I add chopped pecans! This indeed an excellent banana bread. 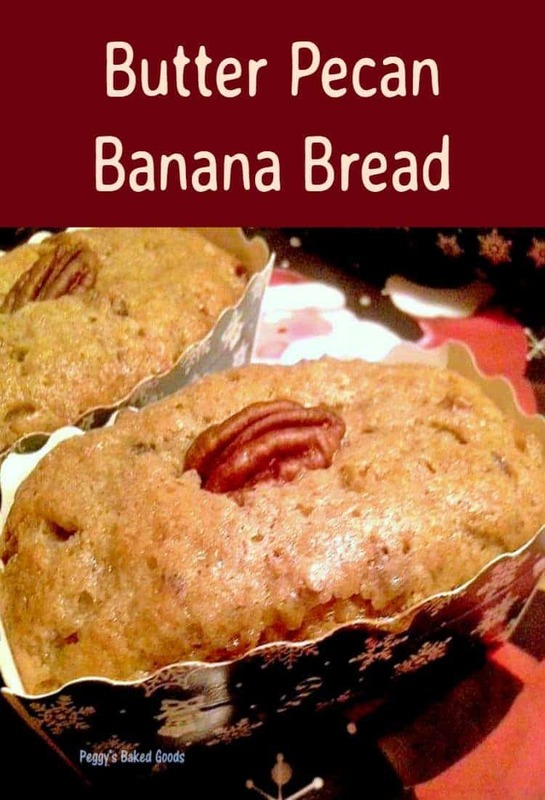 I am a chef by trade and baking is my “thing”, I will be using this recipe as my go to recipe for banana bread. Your recipe instructions are clear and precise. Thank you for sharing this recipe with us. Hi Amy, sorry to hear you couldn’t follow the recipe very well. Step 4 of the instructions tell you when you should add the salt and soda. If you are new to baking, a good tip is to always read a recipe all the way through a couple of times before you start so it is clear in your head. I often find if I don’t do this, I can miss a part out very easily! Thanks for mentioning that you made it with coconut oil! I was just wondering myself if I could use it instead of butter. I’ll make one with butter and the other with the coconut oil. Just trying to make it a little healthier for me. Made this today. The only thing I did different was use coconut oil instead of butter. I made a double batch and put pecans in one and not the other. This is the BEST banana bread recipe I have ever used. LOVE it! Thank you!!! Hi Teresa! Thanks so much for your feedback. The addition of those pecans sounds wonderful! So happy you enjoyed the recipe!! I was wondering if this could be made in a bread machine? Most bread machine recipes call for so many ingredients and I’ve made this recipe before and love it! I just want to make it in my bread machine instead of the oven. 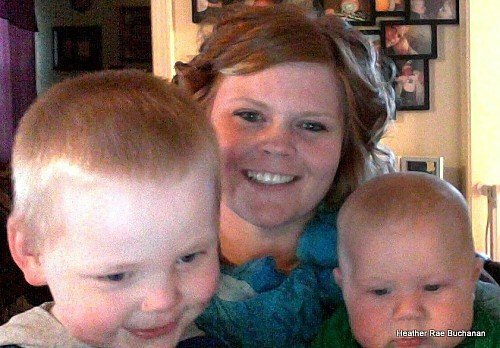 Hi Krista, We haven’t had anyone make this recipe using a bread machine. I would not advise it because the bread machine is designed for kneading the bread dough, which is a different technique from when you make the batter for this recipe, which is a cake batter. Yes this helps a lot! I’ll continue to make this recipe, but find some other type for my bread machine! thank you! Again this recipe is AWESOME!! You’re welcome Krista. On a side note, does your bread machine come with a recipe book, and also, sometimes when you Google for the machine you have, and type cake recipe, you ‘might’ come up with one. Personally, I haven’t ever done such a recipe in my machine. But do let us know what you discover!! I do have a recipe book, and ended up making mini muffin’s with your recipe! I only wish I had more bananas to make a double recipe! As for my bread machine I have to fiddle with it some more, it isnt doing so hot in making bread. Oh and Happy Christmas to you and yours as well! Be safe this holiday season! I have substituted butter for coconut oil melted and wheat flour and truvia for sugar- comes out a little more dense- but awesome. Love the recipe how it is posted and give loaves as gifts but just wanted to share a slightly healthier alternative. Thanks so much for adding your alternatives. It’s very helpful for any who might also want to change the recipe to their liking and of course since you have actually tried the changes and reported back, it makes it perfect advice! Much appreciated and we’re so happy you enjoyed reading the post too! Thank you for sharing your family recipe! I made my first loaf just now. I know how personal it can be to share your family recipes. She lives on! I will certainly let Heather know. She is always so happy when she sees people have made her grandma’s recipe, I agree it really is a special thing to be able to share something so personal. her grandma would be so happy too I am sure! Hey Lisa, so cool! Glad it turned out great. 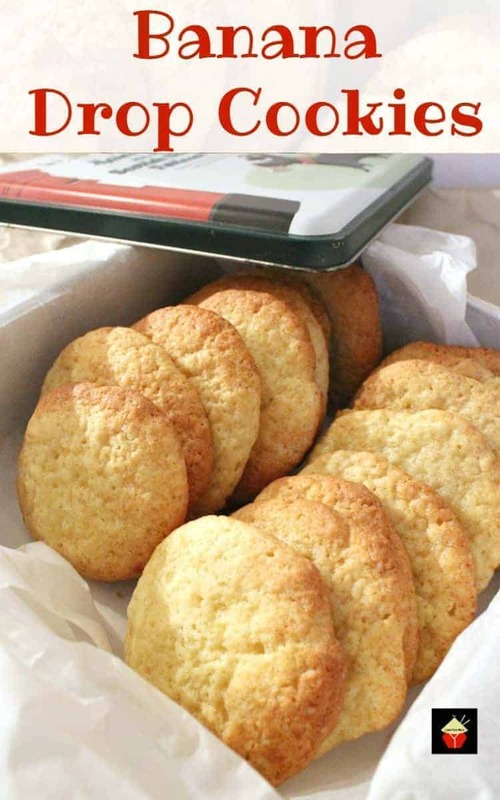 It is definitely a tried and tested recipe so I’m glad you had success with your baking! Please do send in a pic, I;d love to see your loaf! yep, this is the one I use all the time. I serve it at our bridge club and am constantly getting compliments..One trick, the riper the bananas the better. Mine usually sit in the refrig a month or more before I use them, seriously, by then they are so sweet and the bread turns out wonderful. Hi, I agree about the ripeness of the bananas! 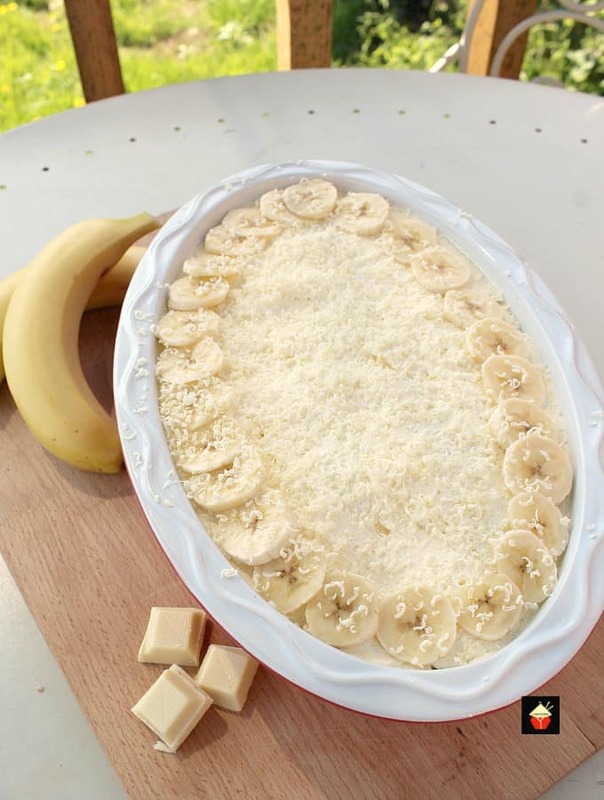 Over at our Facebook page, Lovefoodies, there you will see we are having a ‘banana browning’ exercise, as our group will all be making this recipe in the next couple of days! Would be lovely for you to pop over and say hello to us there!